Will this be a Marine's best friend? Occasionally, the museum displays experimental weapons, air craft or vehicles. If they ever park an EFV (Expeditionary Fighting Vehicle) out front or in Leatherneck you can be sure I'll post about that. 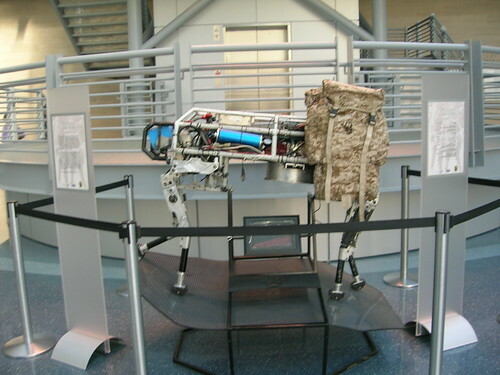 Let me introduce you to "Big Dog", a robotic quadruped designed by Boston Dynamics and funded by the Defense Advanced Research Projects Agency (DARPA). 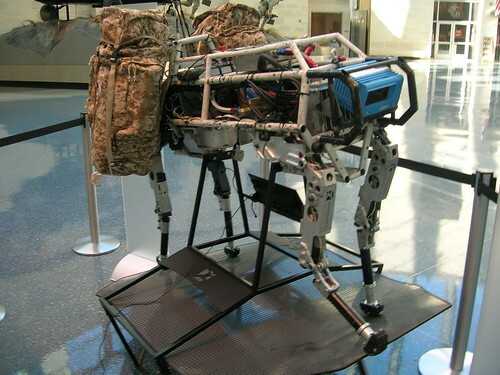 According to the information from Boston Dynamics, Big Dog can run at 4 miles per hour and can carry a 340 pound load. 4 mph is actually pretty slow when I think about it. The goal is to create robots that can handle rough terrain and go where humans and animals can go. As far as a military application, well, its kind of loud, so not sure if this is something that you'd want when you want to keep a low profile. However, I'm sure over time, this could be improved. The retired Marines at the museum commented that the Marines should just use pack mules, they are quieter and can carry heavier loads. Big Dog is powered by gasoline. Maybe a solar powered Big Dog would be more practical or battery powered. From a technical stand point. I think its pretty darn cool. Below is a video showing test scenarios. 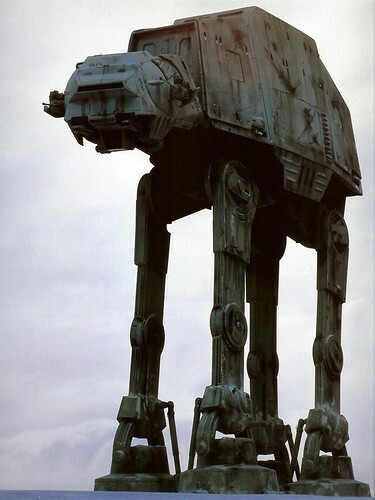 Here is a scene from Star Wars and the AT-AT in action. Its facinating how these movies when we were kids helped spark our imaginations to actually create functional technology. Even though the Big Dog is impractical now, it excites me about what the future might hold. Well that's some awesome engineering, and you never know what kinds of wonderful things it could lead to!